Los Angeles is the youngest of the four provinces of the Congregation of St. Joseph of Carondelet. 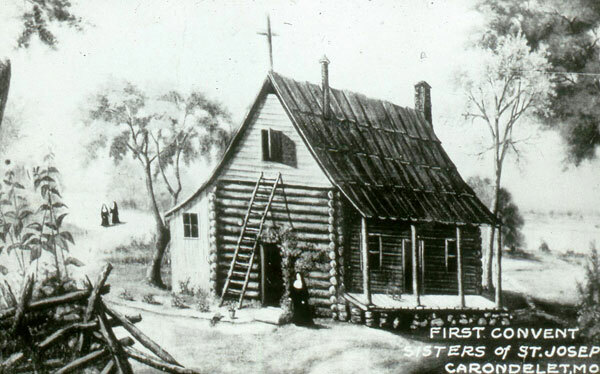 Already well known in the eastern part of the country with provinces established in St. Louis, St. Paul, and Albany, the Sisters of St. Joseph received an appeal from two pioneer bishops in the West. Santa Fe bishop John Baptist Lamy, and the newly installed bishop of Tucson, John Baptist Salpointe, wrote to Carondelet in the late 1860s asking for Sisters to establish a school in Tucson, Arizona. Seven Sisters began the long journey to the west in April 1870, traveling on the newly completed transcontinental railroad to San Francisco, by steamer to San Diego, and by covered wagon across the American Desert to Tucson, Arizona. Their first school, the future St. Joseph’s Academy, opened on June 6, 1870, eleven days after their arrival in Tucson. Ministries spread rapidly from this early beginning with schools opening in Arizona and California. Close to the Sisters’ hearts was the education and care of their beloved Native Americans. By 1873, the Sisters had opened a school for the Papago Indians at San Xavier del Bac. Within a few years, they were ministering at Fort Yuma, St. Anthony’s in San Diego, St. Boniface School in Banning, and St. John’s Mission School in Komatke. When Bishop Salpointe opened St. Mary’s Hospital in Tucson in 1880, health care became an important part of the Sisters’ ministry. Over the years, the sisters sponsored and operated hospitals in Arizona, California, Washington, and Idaho until recent developments in health care led them to transfer ownership and sponsorship to a Catholic health system. As the majority of ministries increased in California, Los Angeles was selected as seat of the western province and established in 1903. Academies were established as early as 1882, Mount St. Mary’s College (now University) was founded in 1925, and Sisters were teaching in parish schools in five states. Work with the deaf, a treasured tradition since the first days in St. Louis, flourished for many years in Oakland and San Francisco. In 1925, the Sisters of St. Joseph of Lewiston, Idaho, joined the Carondelet congregation. In 2011, the Sisters of the Vice Province of Japan joined the Los Angeles Province as a region. From the first days in Arizona, education and health care merged naturally into other forms of care of the dear neighbor. Over the years, and especially after Vatican II, the Sisters’ work has expanded and diversified, including parish service, adult education, spiritual direction and retreat work, direct service of the poor, and justice activities.